Three days left to place your pizza orders, and your dvd orders! We’ll be at the VPAC at De Anza tonight until 9:00pm. Have you ordered your pizzas yet? we have a cast party every after the Sunday show and we have pizza and fun! Please check with Barbara tonight, tomorrow, and Friday to get your order placed. Hello dance family! We have regularly scheduled classes this week, except for Saturday! We are in the studio from Monday to Friday only. Please call us with any questions you may have, and remember to Like our Facebook page to keep up with announcements! Rhythmic Movements Performance Feb. 12! Join us on the 12th of February at the “Travel and Adventure” show. We’ll be at the Santa Clara Convention Center at 12:00pm on the Global Beats Stage. Easy to remember! Be there at 12:00 on the 12th! We always love to perform for our friends and family, so be sure to get your tickets and come see us! Check out the link for more info and we’ll see you there! Our monthly rates will be changing on March 1, 2017! Please ask your teacher if you have any questions. We are in the studio Monday through Saturday. Check the schedules page for times. We’ve spent the summer and autumn months perfecting our techniques and we have some performances in store for you this week and the next! We need all our performers to be at the school at 6:00pm, one half hour before showtime. Costumes, if they are being worn, will be discussed in each individual class. Please ask your teacher what you or your child needs to wear. We also have a canned food drive every year and request you bring something non-perishable as your ticket in. We then donate all items to Second Harvest Food Bank! We are ordering zippered hoodie sweatshirts for the autumn and winter seasons! Each sweatshirt comes in childrens sizes Small to Large and adult sizes Small to 3XLarge. We will have you or your dancer’s name embroidered over the right side, and our studio logo embroidered in blue on the left. The sweatshirts are dark grey in color and feature a white drawstring to tighten the hood. we are placing final orders this October 15th. All items are being sent to the studio for easy pick-up at any time! Call us at (408)985-0187 with any questions, or check your email as Rhonda has sent out information last week. Thanks and Keep On Dancing! T-Shirts and Sweatshirts Pre-order NOW! T-shirts, sweatshirts, and even tank tops are available for pre-order/purchase now! 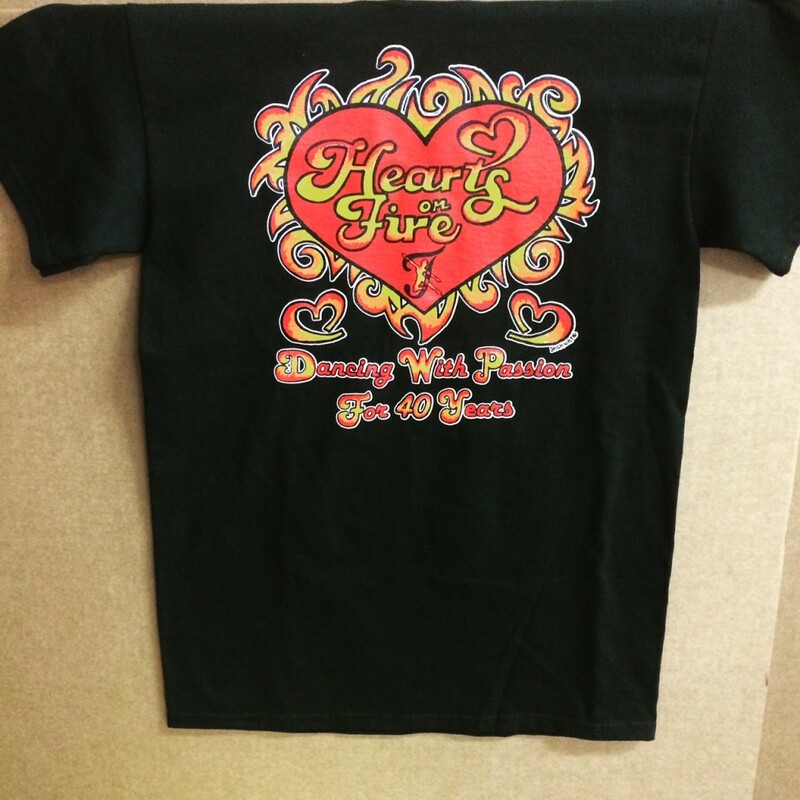 All items except the racer back tank feature our 2016 Hearts On Fire logo on the front, and a full list of all participants on the back. Starting at $20, sizes range from children’s small (6-8) up through men’s and women’s 2X in styles from tank tops to hooded sweatshirts. Please note that not all styles and sizes are available, ie- we do not have men’s tanktops. Shirts come in black or white, so please specify which color, size, and style you’d like when you place your order. Order your shirts before the show and you can wear them to rehearsals onstage, and on performance days! Pick up is available at the studio, and at West Valley on Rehearsal Friday. Come early to see Rhonda on Fridays, please!